So far I’ve had over 1,100 people sign up for my blogging course since it debuted in February, and the reviews have been great! 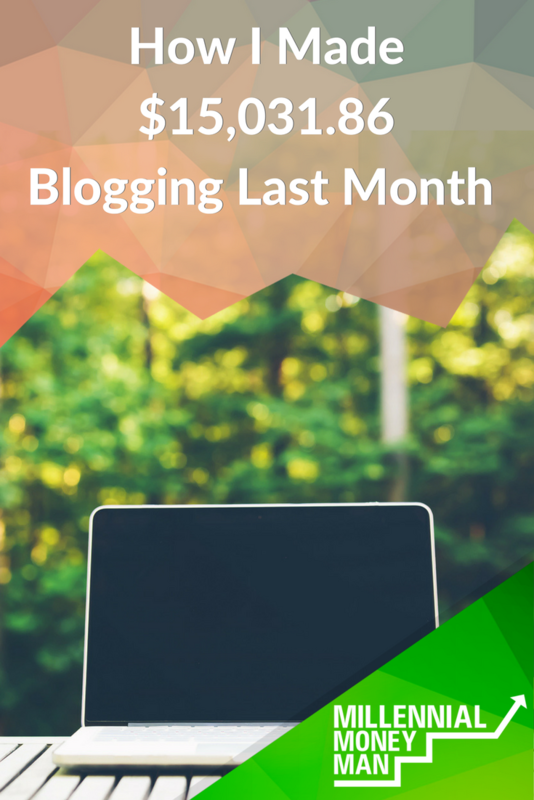 Even if you are just thinking about starting a blog or want to figure out how to get more traffic to the one you already have, this will be useful for you. I've increased the amount that I pay myself recently, which means that I'm paying more Social Security and Medicare taxes than I used to. I also pay quarterly taxes that will probably have to increase next year as well. July felt like a super weird month for M$M. You always hear that the summer is the slow time of year for blogs, but my traffic was up pretty substantially from June. I also had my highest month ever for my affiliate income streams, so that was pretty sweet too. My wife has been off for the summer and goes back to work in a week or so. Luckily this summer I was able to balance growing my business with getting some quality time with her. Unfortunately (or fortunately…not sure) I think I've passed the point of no return. I would have a hard time ever going back to a “normal” job after having the experience of running an online business like mine! I felt like I had been stuck in a rut with my affiliate income (not that I'm complaining), but I really wanted to grow this revenue stream this month and was able to do it. More streams of income = more freedom. One of my goals is to have a $10,000 month for my affiliate income this year, so we'll see what happens when everything picks up in the fall! This was the main reason I thought that July was going to be a down month. I've been doing this awesome staff writing gig for several months now, but I knew that it could go away at any time. Surprisingly, the project I was working on has only been put on pause temporarily until September and will pick back up then. It's actually pretty perfect timing for me since I need to get moving on my marketing course, and my affiliate income and ad revenue jumped up substantially this month so I didn't take the revenue hit I was thinking I would. Funny how that stuff happens in business, right? July was a killer month for my ad revenue! I've been working with AdThrive the past few months, and they do an awesome job of managing all of my ads for me and growing my revenue there. The RPM (revenue per thousand views) of my ads has basically skyrocketed over the past few months, which is awesome. You have to have over 100,000 views a month to apply to be part of AdThrive's network, but if you're a blogger and hit that mark I'd highly recommend applying. I also had a random sponsorship opportunity roll in that paid really well and was fun to work on. Last month I said that I couldn't wait for the summer to be over, but now I'm looking at the rest of the year and wishing summer was longer haha. The end of the year is going to be nuts for my business. I'm adding two more seasonal marketing clients, selling my course in October that almost 200 people have already signed up for, traffic will be up, affiliate sales will rise (in theory), etc. The course is going to be the big unknown in terms of how much extra work it will put on my plate, but I'm excited about it. I really think it's going to help a lot of people make more money and take my business to the next level. I've also had a TV station in San Antonio ask me to start doing regular financial segments with them, which is exciting! This may finally be the time that I have to hire someone to help me run a few aspects of the business…we'll see. Seriously…that's the only way I know how to describe it. Within just a few weeks there are already 1,700 people in the Millennial Money Man Community and it's growing almost faster than I can keep up with it. This turned out to be a much more positive experience than I could have imagined. It just confirmed to me that I have genuinely good people that read M$M. The group is a lot of fun for me because typically most readers don't comment or say anything on the actual site! I've had a lot of fun getting to know people and get a better idea of what kind of content this community needs. You can get into the Facebook group here, and please be sure to answer the questions after asking to join! On top of all of the stuff I mentioned above, we are also going to be moving way sooner than I expected. The builder is jamming on our house right now. Cabinets and floors are being installed this week, and the outside is basically finished with the exception of fencing and landscaping. Coral and I are sooooooooo over living in an apartment, so this will be awesome. Why haven't you joined the private Facebook group yet? Awesome progress, and great that your affiliate income helped fill the gap you thought you’d otherwise have. I still have a long way to grow to pursue Adthrive, but it’s good to see you’ve had some awesome results with it. You’ll get there! Yeah it was really surprising, but Bluehost had a sale that went really well. Awesome! And happy to hear you’ll be in the new house soon! Nice progress! Congrats on having an awesome sidebar month, that’s huge! And congrats on moving into the new house early. That’s gotta feel good! Looking forward to the marketing course! Awesome progress! You’re killing it on affiliate and ads! Can’t wait to see what those numbers will look like come fall. Bobby living quite the busy life! Love watching the progress on your house on Instagram. You guys have to be biting at the bit to get moved in. Congrats on another successful month running your site, it’s always motivating to see. I did have a question. For your digital marketing gig, how many clients do you run services for? I cap it at 5 so I can keep growing M$M – not all of them are at the same time though. One of them is all year round, and the other 4 have me do things during different times of the year because their business is seasonal. For example: one of them is a meat market/deer processing store that wants campaigns only during hunting season. Congrats on another great month! You’ve been great to follow and super inspiring! Looking forward to checking out the course! Thanks Jamie! I’ve got to get a ton of work done on it this month haha! Goodness, you have a lot of plates spinning! Looks like you have some big stuff lined up for this fall/winter! Hiring some help might let your income grow even faster. I think most people wait to long and end up leaving a lot of money on the table. Yeah I’m like right there haha. If the course comes out and gets a little overwhelming I’ll have to hire someone for sure. Woah a nice month of earnings! One of our objectives is to get the pageviews to apply for AdThrive. It seems they pay much better than AdSense. Nice affiliate income too. We are planning to ramp affiliates up once we get our views up a bit more. Thanks for the income reports! This is amazing. I just came back to the blog after a few months and it’s crazy and awesome to see how well you are doing!